Artist's illustration of a dangerous asteroid streaking toward Earth. Protecting Earth from dangerous space rocks might require a little asteroid-on-asteroid violence. Researchers are proposing to add a new arrow to our planetary-defense quiver: steering small, benign near-Earth asteroids (NEAs) into big and hazardous ones, in a dramatic, high-stakes game of cosmic billiards. "It'll be a little while before we can do this sort of thing, but I think it does show promise," David Dunham, chief mission design engineer at the Arizona-based company KinetX Aerospace, said last month during a presentation with NASA's Future In-Space Operations (FISO) working group. On that day, a meteor exploded in the sky over the Russian city of Chelyabinsk, generating a powerful shock wave that shattered thousands of windows in the buildings below. About 1,500 people were injured, most of them by flying shards of broken glass. Scientists think the Chelyabinsk object was just 65 feet (20 meters) or so wide. And there are plenty of bigger — and therefore more dangerous — space rocks cruising around out there in the dark depths, the vast majority of them unseen and unknown. But we don't have to just sit back and wait for destruction. 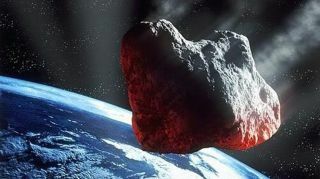 Indeed, scientists and engineers around the world are working on ways to keep Earth out of asteroids' crosshairs. The most sensational of these is the nuclear-bomb strategy, which was made famous by the 1998 disaster film "Armageddon." But the real-life version of this technique would rely entirely on robotic spacecraft, not nobly self-sacrificing miners. If time is on our side — if we have years or, ideally, decades — we could employ "kinetic impactors," slamming one or more (non-nuke-carrying) spacecraft into the threatening asteroid to knock it off course, researchers have said. We could also employ the "gravity tractor" method, which would launch a probe out to fly along with the dangerous NEA. Eventually, this spacecraft's modest gravitational tug would nudge the space rock onto a benign trajectory. And then there's the asteroid-billiards idea. A diagram showing how the asteroid-billiards deflection strategy would work. This concept, which Dunham laid out in his FISO talk, is basically a scaled-up version of the kinetic-impactor method. This speed-boosting, trajectory-altering flyby would steer the spacecraft-asteroid combo toward the hazardous object. As it neared its target, the rock-riding probe would refine its course using onboard ranging instruments, as well as reflectors and transponders placed on the big and dangerous rock, Dunham said. The collision, when it came, would be much more powerful and effective than a smashup generated by a naked spacecraft serving as the kinetic impactor, he said. There would be a lot of additional mass and momentum involved, after all. Consider, for example, that the Mbozi meteorite in Tanzania, which scientists first spotted in 1930, is just 10 feet (3 m) long but weighs 18 tons (16 metric tons). There are enough small NEAs flying around in Earth's neighborhood to make this strategy a real possibility, Dunham said. Indeed, calculations that he, Natan Eismont of the Space Research Institute of the Russian Academy of Science, and their colleagues performed suggest that humanity could feasibly snag a dozen or so such nearby asteroids and steer them into holding-pattern orbits; these cosmic projectiles could then be "activated" as needed. "So, you'd have a whole bunch of these things ready to throw at any asteroid coming towards you," Dunham said. This asteroid arsenal could be especially useful for dealing with long-period comets, which spend most of their lives in the dark depths of the outer solar system and are therefore very difficult to find and track, he added. The asteroid-snagging idea has applications beyond planetary defense, Dunham said: Pre-positioned space rocks could serve as inviting targets for crewed exploration efforts. Indeed, NASA had been developing just such a plan until last year, when the Trump administration canceled the agency's Asteroid Redirect Mission. Dunham stressed that the asteroid-billiards concept needs to be studied in much more detail before it can be fully implemented. He'd like to see the idea demonstrated first on a benign target rock, citing NASA's proposed Double Asteroid Redirection Test (DART) mission as an illustrative example. If all goes according to plan, DART would slam a spacecraft into the 500-foot-wide (150 m) moon of the asteroid (65803) Didymos in October 2022, in a test of the textbook kinetic-impactor deflection strategy.